It’s not even close to the worst thing that has happened to me in days. Or weeks. Or months. In fact, it wasn’t even the worst thing that happened to me on that particular day, though it wasn’t until after I’d cleaned and dressed my wounded hand that I noticed the picture above my media center had vanished from my wall. I looked behind the media center and sure enough—there it was, sandwiched between the wall and the TV stand—my picture. Somehow, during the brief minutes it took for the squirrel to sink his fangs into my hand, the wire on the backside of the frame had snapped, sending it crashing to the floor. I dug the picture out and looked it over. No broken glass. No broken frame. I winced from my still-throbbing hand but counted myself lucky…until I noticed the bits of plastic lying on the floor under my media center. I retrieved the plastic pieces and spent a few confused minutes trying to figure out what they were. They looked familiar, but where had they come from? I reached behind the media center and groped for the toggle switch to turn on the lamp that sits on the shelf next to my media center. The better to see what was broken, and all that…except there was no toggle switch. Ah ha! It was a lightbulb sort of moment in the most ironic sense. In a flash I saw what must have happened inside my apartment while the evil squirrel had been sampling me instead of the leftover Pizza Luce I’d so generously offered him. The picture, its wires snapping, had plunged from the wall and shattered the toggle switch on the lamp cord that hung innocently behind my media center with a precision that could never be reproduced. Now that was a problem because I love that lamp. I’ve had it for years though I can no longer remember where I bought it. It wasn’t particularly expensive, but it spoke to me with its antique bronze base and gold lamp shade with beads and bits of glass that make it just the right combination of funk and function to fill me with delight. I tried to imagine the darkness that would consume my living room in its absence and I was overwhelmed with sadness. Now I am not one to give into defeat easily. I’ll replace the base, I thought. And this time I’ll buy one that has an on-off switch right by the bulb so I won’t have to reach behind the media center all the time. Heck, this is an opportunity for improvement! Determined, I headed to Walmart. Then Target. Then Kohl’s. With zero success. My lamp base, I discovered, was unique. It was smaller than the others. The shape was different. In fact, I couldn’t find one lamp base anywhere that could pair with my lamp shade. I returned home and puzzled the plastic pieces of the broken switch together until I had a rough idea what it looked like before it was smashed by the plunging picture and then I hit the internet. Sure enough. Home Depot sold a switch just like it for about two bucks. Great! I bundled up and headed off to Home Depot, a woman on a mission. All I needed to be back in my cozy living room, sitting by the light of my favorite lamp, was a functional on-off switch and a screwdriver. The path ahead was perfectly clear, perfectly simple in my problem-solving mind. Yes, there were on-off switches. But the cord to my lamp had been shaped by the previous and now broken switch. The electric wire that ran through the cord had been damaged and even with a brand new switch in place, or so the specialist named Tim in the lighting department explained, my lamp would not function. Or it might for a while, but certainly not well or with any reliability. My heart sank. I looked at the lamp shade in my hand. Tim read my face. I smiled at his use of the word “dingles” to describe the beads and bits of glass I loved and decided dingles was the best word I’d heard in ages. “I suppose I could do that,” I conceded, though I was unable to keep the disappointment from my voice. Tim stared off into the distance, but not in a dismissive “Look, lady, I’m busy” sort of way. Rather it was a “hmm, I wonder. Maybe we could…” sort of look I know well. I grew up seeing the same look on the face of my father, an avid fixer of all things broken and inventor of things only previously dreamed, and for a moment I was filled with grief not just for my broken lamp but for my life that has been forever dimmed since my father’s death. I tried to picture that—me, rewiring a lamp—and laughed. “I wouldn’t know where to begin,” I said. Tim nodded and darted from shelf to shelf in the lighting department, eventually returning with a small treasure trove of wires and switches and do’hickeys and things I would call dingles. “Come with me,” he said and so I followed him to his work bench where he held out his hands and into which I entrusted my lamp. Tim began by prying off the felt on the base. 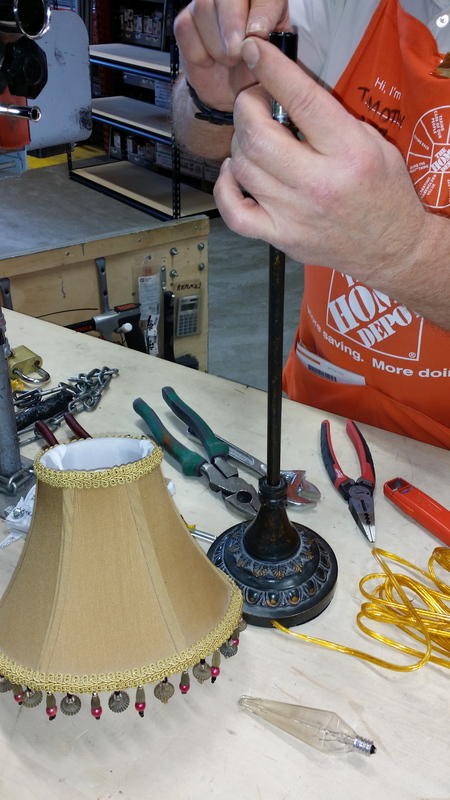 Then he started snipping and tugging at things, gutting the lamp with a fervor reserved for surgeons and handymen. It was painful to watch, but I knew intuitively that I could trust Tim. My poor lamp! In a matter of minutes it was lying on Tim’s bench in pieces, but he didn’t leave it in that condition long. He pulled out his knife and opened the package of a new lamp wire I had yet to pay for. Then he taped the ends of the wire together with a black rubbery like tape and threaded it into the base of my lamp. I watched, amazed, as the wires poked out through the neck. Smart, I thought. I wouldn’t have thought to do that! Tim continued working. He tied a knot in the wire that stuck out of the base and tapped the felt back in place. And then he really got to work. I wish I had the understanding or the vocabulary to describe all that Tim did. I know it involved splitting the wire, testing charges, screwing things in place, tightening and all sorts of other little steps, but even now I could not describe to you the process of rewiring a lamp. All I really know is that after an hour in Tim’s expert care, my lamp was restored. He had even added some schnazzy gizmo that magically transformed the metal itself into an on-off switch. One touch to the neck of the lamp and it not only turns on, it can shine at three different levels of light. No clunky switch. No need to reach behind a media center. Just my lovely little lamp with all its beautiful dingles, not only restored but improved. Are you listening? The voice I have recognized throughout the years as the voice of the divine whispered in my soul. I gulped and felt the pain of the past months swell inside me, but still I resisted. You see, I still wanted an easy solution. One that would turn back on all that is good and healthy and wonderful and that will extinguish all that is painful and destructive and life-shattering. This is a lamp, I told the voice. For all that other stuff, I’ll take an on-off switch, thank you very much. The voice did not laugh. It knew the pain behind my words. Has been with me throughout it all. I know you do, but switches like that don’t exist. What is required is a total rewiring. A change from within. And that will require you to surrender that which is most precious to you into the hands of those with greater knowledge. But… I stammered, what if they get it wrong? This time the damage will be permanent. The lighting department at Home Depot grew suddenly warm and comforting and I heard the voice once again. You don’t need to be afraid. I have already brought the right people for this job into your life. The relief that hit my spirit was so strong I almost cried. I did hug Tim who looked grateful if not a bit surprised. And then I brought my lovely little dingle lamp back home, new and improved, and returned it to its place of honor in my living room where it shines both light and hope into my life today. ← GAYYA.ORG is hanging with us today!